This is part of the 'Trail of coins' which went at least twice around the corridor and the library for Children in Need. 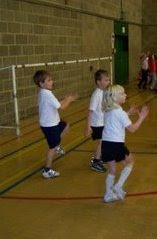 Y2 children enjoying an aerobic 'Wake and Shake'. This is Mr Cuddles and the Debenham HS Sports Leaders leading lots of Year 2 children from the pyramid schools in a conga finale to the 'Wake and Shake ' festival held on Wednesday 19th November. On Tuesday 25th November 9 children from Yr 5/6 took part in the Small Schools Unihoc tournament at Debenham Leisure Centre. They played extremely well during the morning, and finished in a very creditable joint 3rd place, only losing to the eventual winners - Helmingham. Our results were: Won -1 Drew - 3 Lost -1 Black eyes - 1 ! 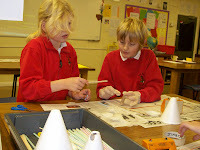 18 children from Earl Soham visited TMHS for a fantastic day of ICT, Science, Design Technology and Literacy. The children had great fun designing and making a rocket to send out a signal to ensure that their coach arrived to pick them up! They also looked at how to measure the altitude that their inventions reached. The TMHS staff were excellent and this was matched by the interest shown by the children and their results - the bus arrived on time! While Year 5 and 6 pupils were at Thomas Mills High School today, Mr Mansell worked with a group of Year 4 pupils to produce this short film about the Chinese folk-tale, Li Chi Slays the Serpent. The children began by recording themselves reading the story. They then produced some artwork depicting different scenes in the story. In the afternoon, we used plasticine to make models of the characters in the story and animated them using stop-frame animation techniques. The children then put everything together using Windows Movie Maker to produce this short film. The One Christmas concerts are fast approaching and I'm pleased to say that the CD is now available to purchase. Copies are available from the school office at a cost of £10. All proceeds (after manufacturing costs) go to the charity Tearfund. Mr Pearce was very excited to see the CD arrive and couldn't wait to put it on and have a dance! Thanks to everyone who brought in some coppers for our coin trail. We have raised nearly £53 for Children in Need. 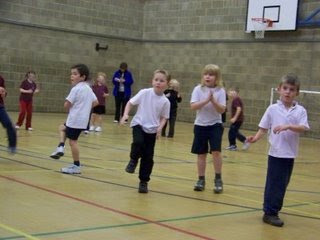 Welcome to the first post on our new school blog. We hope that you find this a useful area to find out what has been happening around the school. This first post is all about the dotty goings on on Children in Need day. Children arrived at school in all manner of spotty outfits (and some of the staff looked a bit odd too!). One child even went to the great effort of getting into character as a dalmation, with a full fancy dress costume. Children brought in copper coins and we made a trail which went twice around the school corridor! When some boys from Blue class collected all the money in a bucket at the end of the day they could hardly lift it. We would like to thank everyone who made an effort to dress up and brought in a contribution. We will let you know soon, after poor Mrs Sayer has counted all of those coins, what the grand total came to.